Children, please come here; I need to talk to you. When you attend 8th grade, you will read of this day in your history books. But today, I need you to just bake Christmas cookies. I must focus on other matters. The dough is prepared for you in the refrigerator. So, while the world held its collective breath, my three children made Christmas cookies. December 13, 1981, Warsaw, Poland - The day that stays with me forever. Ringgg. There Grażina stood, ringing the bell at our front gate. Bizarre. What brought her here so early on this December Sunday morning? The shocking answer walked in the door with her. Now, Soviet tanks lined the Polish-Soviet border. They waited impatiently to give the Polish military one final chance with Martial Law to restore order. The clock ticked like a time bomb. If the government failed, the Kremlin and Leonid Brezhnev sat poised to succeed. “Where is Larry? At a time like this, where is Larry?" Larry departed the previous day, driving through Poland, through Czechoslovakia, into Austria and the free West, to attend a required directors’ conference in Vienna. “If in danger, call Roy.” The predetermined crisis management plan kicked in. I lifted the receiver to telephone our colleague Roy to receive further instructions from him. Instantly, I heard the sickening sound of silence. Dead. All phone lines turned off across the entire country with one simple flip of a switch. Further reality descended on Debby: no contact with Roy across town; no contact with Larry across the border; no contact with my family across the ocean. Bolting to my kitchen table, I turned on our shortwave radio, which sat in the window nearby. Normally, the top of the hour provided a brief five minutes of news from the outside world. But this was not normal. Would the news come through? My heart raced. With shaking fingers, I adjusted the dial. The crackling static caused near panic of a jammed broadcast. But then – it came through! 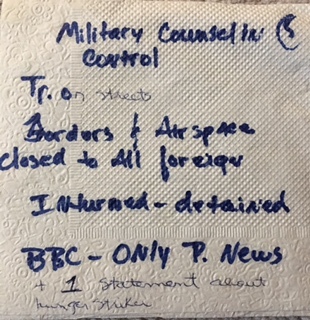 Grabbing the only item available, paper napkins (see below), I feverishly jotted down sketchy notes from the words of the foreign correspondent of the BBC. I felt like I listened to the voice of my best friend. Martial Law has been declared in the nation of Poland, and all contact with the outside world is severed. The Soviet military sits poised for intervention on the border between the two nations. Thirty five million citizens are given 48 hours to return to their legal place of registration; a mandatory curfew is enforced. All borders are closed; all international flights and international trains are cancelled. I desperately needed to be alone with The Lord. My missionary manual contained no chapter on Stan Wojenny, but I knew my Bible did. The Soviet Union would have to wait while I talked to Jesus. Larry’s whereabouts remained a mystery, but God’s whereabouts remained Rock Solid. His protection surrounded Larry in the mysterious unknown; His presence surrounded the children and me right here at Ulica Dembińskiego 4B, Warsaw, Poland. My faith, though being tested in fire, found solid footing in His Word. Now what…? Life consumed my attention. The day progressed. My children baked cookies; I listened on the hour to the BBC’s five-minute updates. From time to time, I stared at the scene out my window. The slant of the anemic winter sun offered no warmth. Sub zero December temperatures made the landscape appear frozen in time. Our street stood deathly quiet. The cheerful sounds of neighbors’ greetings - gone. The screeching sounds of trams and buses on their routine routes – gone. The laughing sounds of children jostling and dragging sleds to the nearest hill – gone. Gone - all of it. Fear hung a foreboding curtain of silence as thick as the frozen layer of ice on the streets. My Żoliborz neighborhood mirrored the paralyzing anxiety that gripped this nation. Eventually, Roy came. I still don’t know how he managed, but he did. He came to check on us. Together we contemplated: What would happen when darkness fell? What would tomorrow hold? How long would this last? Would the Soviet tanks roll in or would they stay at the border? And no, we could not dodge the question: “Where is Larry?” Is he safe or is he in danger? When will we see him? How will we even talk to him with the phones lines cut? Questions without answers stared us in the face. Having established contact, our friend set out again to care for his own family. He promised to return in the next couple of days. Routine offers comfort in the middle of a crisis. I busied myself with the thought of making dinner for the children. As darkness fell, I couldn’t resist one more gaze out the living room curtain before going to the kitchen…. Shock and disbelief gripped my entire being. The brake lights belonged to our car! On the dark frozen street in front of our house stood our automobile and its driver. Fireworks of thanksgiving set off in my soul, and a waterfall of relief washed over my heart. Older PostWhat Did My Daughter's Wedding Teach Me About Christmas?